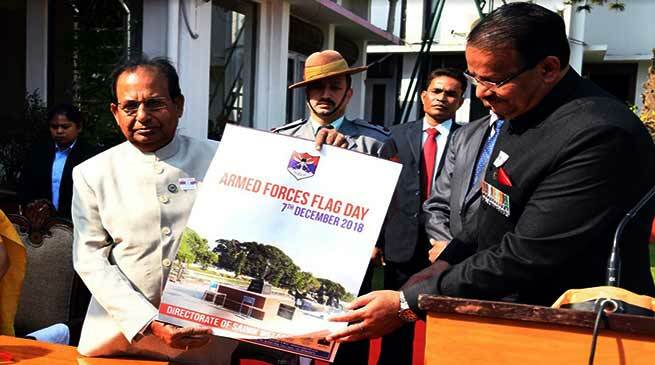 7th December is observed as the ‘Armed Forces Flag Day’ throughout the county. Since 1949, this day is celebrated to honour the martyrs and the men in uniform who not only laid their lives but also valiantly fought for the county’s honour and safety. It is for the fifth time that the event is organised at Raj Bhawan, Guwahati to celebrate the Armed Forces Flag Day. The guest includes senior bureaucrat and police officers from Govt of Assam & Senior Armed Forces personnel. The event was also attended by Gallantry award winners, War Disabled, War Widows, Ex-Defence Service Officers. The Gallantry award winners were wearing distinctive badges for easy recognition in the function.The day provides an opportunity to connect with Armed Forces Personnel, their families and to reciprocate our admiration for them by contributing generously to Armed Forces Flag Day Fund to ensure welfare and rehabilitation of War widows, War Wounded and dependent of our fallen soldiers and Ex-Servicemen. Governor of Assam Prof Jagdish Mukhi while addressing the gathering exhorted the Gallantry award winners, War Disabled, War Widows, Ex-Defence Service Officers and thank them for their contribution to the Nation. The most important gift from the Governor and the Chief Minister of Assam to the Ex-Servicemen community of Assam has been the ‘War Memorial’ and ‘Sainik Bhawans’ at Guwahati, Jorhat, Haflong, Mangaldai, Dhubri, Diphu and Silchar. These structures have provided the due recognition and respect to the Martyrs and Veterans and are one of the best in the region. Moreover, the Directorate of Sainik Welfare, Assam is working to bring the Ex-Servicemen to support Govt of Assam by affiliating ESM with Govt schools and developmental activities without financial implication thereby harnessing the potential of ESM. The Governor has been keen in enhancing the welfare and rehabilitation measures for Ex-Servicemen community of the state. He also directed the Directorate of Sanik Welfare to focus on other areas such as private sectors in the State to get second employment to ESM for the their long lasting rehabilitation. The Governor also had interaction with the War Widows, Ex Servicemen who had come from different places of the state.